Provides Two Factor Authentication (2FA) using One Time Password (OTP) codes generated by the Google Authenticator App. Google Authenticator, Microsoft Authenticator, Authy, DUO mobile, etc. they have been individually configured to use at least one 2FA provider (eg. Authenticator Apps). If users have already been locked out, please Contact us! Click the Enabled checkbox: the other checkboxes are optional - read their explanations for further details. have been individually configured to use at least one TFA provider (eg. Google Authenticator). Navigate to Users & Roles > Manage Policies. Click Set Role Policy (in the Role Policies section). In the popup that results (shown below), attach the Policy to a role of your choice and click Set policy. Navigate to "Users & Roles > Manage Users"
It is best to let the user configure their own secret, however, admins can also set as necessary. Click the name of either a user with the role from step 3 or the user from step 4. 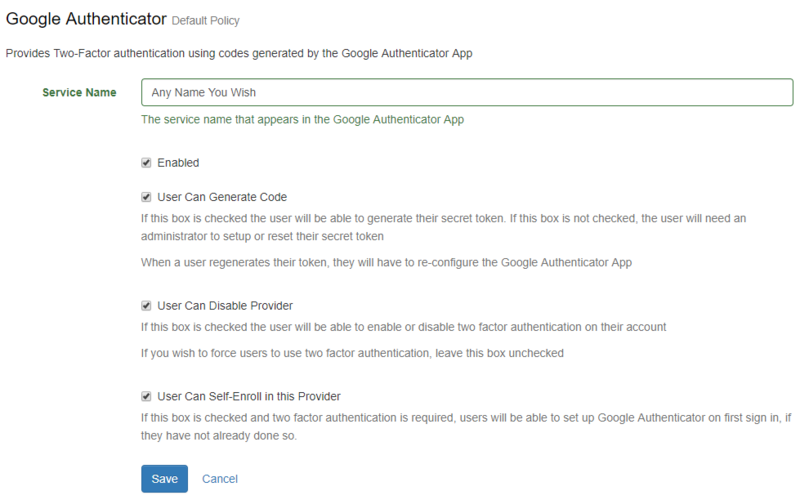 In the Policy Information section you should see a 2FA table; click Configure in the Google Authenticator row. Click Enable; you'll be taken back to the user's Details page. Click Configure again, and keep the resulting page open. (Optionally) Save the secret in a secure location, and/or forward this info to the user. The Authenticator application protocol is time-based. This has been the only authentication issue for users of Authenticator apps, which rejects valid tokens.